Timber has been having a renaissance moment lately, with contests like the Timber in the City: Urban Habitat Competition doing their part to promote the natural building material as a sustainable building element in urban areas. This year's winning design, Stack Exchange, envisions a futuristic, multi-dimensional community on NYC's Lower East Side composed of volumes of timber stacked strategically to provide ample residential space and communal areas for urban farming. University of Washington students, Buddy Burkhalter, Mingjun Yin and Connor Irick used a traditional lumber drying process as inspiration for the Stack Exchange design. In the proposal, large timber blocks would be created by stacking the volumes alternately and rotating them 90 degrees. 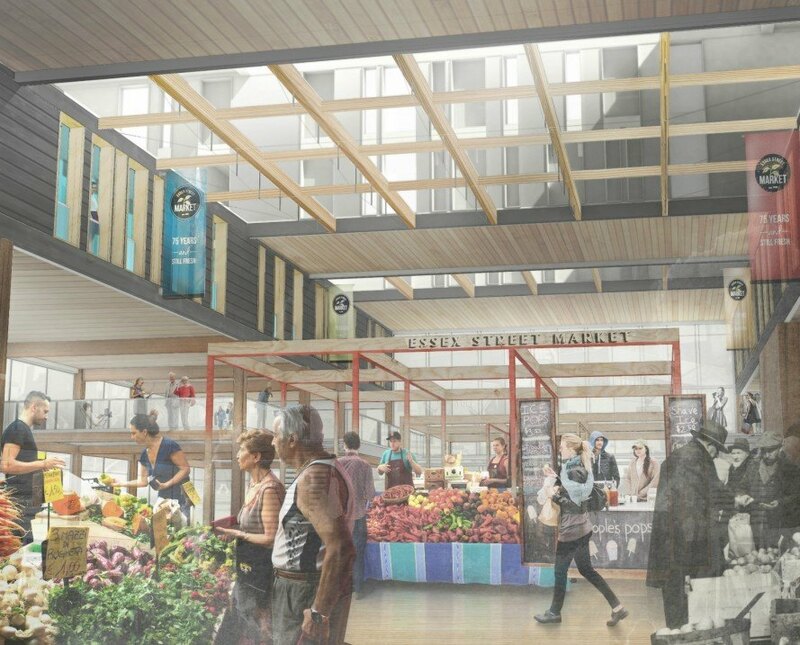 Market and gallery spaces would occupy the lower levels with residential spaces floating above. The stacking method would be used to create voids in the structures that would permit ample daylight, ventilation, as well as private and semiprivate amenity spaces within the community. To address the city’s lack of affordable housing, the design proposes double the units required by the competition. The units are also larger than required in order to meet the needs of large families and age groups. Locally-sourced Cross Laminated Timber panels would be used as the primary structural material of up each modular “residential bar”. According to the design details, the construction materials would be delivered as a flat pack from the Brooklyn Navy Yard and assembled on an adjacent empty lot. The stacking method would be used to create voids in the structures that permit daylight, ventilation, and private and semiprivate amenity spaces within the community. Using a traditional lumber drying process as inspiration for the design proposal, timber housing bars would be stacked alternately and rotate 90 degrees. To address the city's lack of affordable housing, the design proposes double the units required by the competition. Hybrid Domains by University of Oregon came in second place in the competition. Third place design, Grid + Grain, by the University of Washington.Washington. Third place design, Grid + Grain, by the University of Washington.